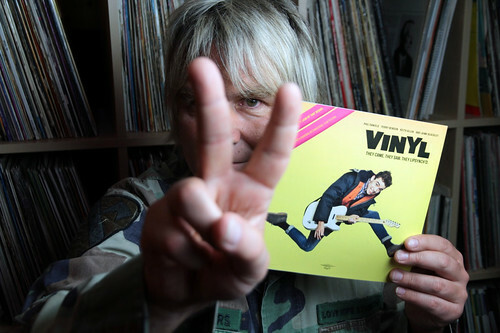 Free Rock And Roll by The Alarm (featuring Phil Daniels on guest vocals with Mike Peters), is the fast and furious lead track from the forthcoming ‘Vinyl’ soundtrack album due for release on March 4th 2013. 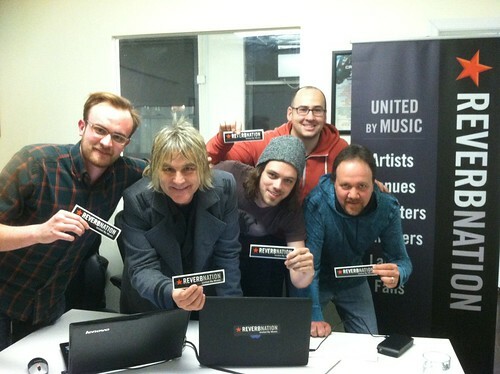 As Mike announced at The Gathering 21, bands / artists who have a ReverbNation profile page can also submit to a unique opportunity and get to be the official opener for each individual night on The Alarm’s Vinyl UK Tour. 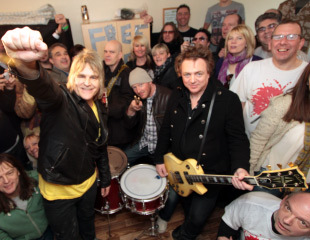 “This year the Alarm office has been inundated with requests from artists all over Britain to support like I’ve never known since I started the band…. so we decided to do something about it and linked up with ReverbNation who have provided us with a fair and equitable way that gives everyone a chance to be part of the tour in some shape or form be it on stage or getting their new music played over the PA” said Mike Peters when launching the opportunity direct from the offices of ReverbNation in New York City (see photo below). A short instructional video is also there which outlines the band opportunity during which Mike demonstrates the chords in a how to play ‘Free Rock And Roll’ sequence that may provide successful applicants with a chance to be at the ‘Vinyl movie premiere in Leicester Square, London on March 12th.